Allied leaders pose in the courtyard of Livadia Palace, Yalta, during the Yalta Conference, February 1945. (I haven't been able to determine the precise date of this photograph, but the conference was held February 4-11, 1945.) View a larger image. 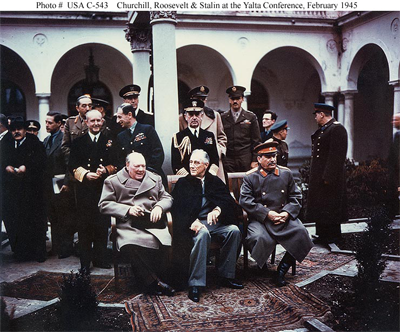 Those seated are (from left to right): Prime Minister Winston Churchill (UK), President Franklin D. Roosevelt (USA), and Premier Josef Stalin (USSR). Stalin had long nurtured a desire to be the first to seize Berlin as retribution for the perfidy Hitler displayed in breaching their non-aggression pact. But Stalin's allies — and most particularly, their generals — harbored similar desires, albeit for different reasons. There were conversations at Yalta regarding the assault of Berlin, but Stalin did not reveal the intensity of his motivation. On March 7, just about four weeks after the conference, Stalin assured Eisenhower that Berlin had lost its strategic importance. At the same time, he ordered the Berlin assault preparations accelerated. The final assault on Berlin began on April 15 with a million-shell artillery barrage. Stalin was here using deception, analogous to the "IED" technique described here, to prevent competition from his allies for the prize of Berlin. Photo #USA C-543 from the Army Signal Corps Collection in the U.S. National Archives, available from the U.S. Navy Naval History and Heritage Command. We need not be placid victims of devious political operators at work. And we need not respond in kind. We can often disable their tactics before they harm anyone. Here's another installment of devious political tactics, with suggestions for ethical, effective responses. The operator who's aware of the Dunning-Kruger Effect can deliver important and perfectly sound information in a halting, circumspect manner. By arousing in the recipient doubt about the validity of the information, the operator limits the likelihood of the recipient acting on it, while simultaneously providing evidence that the information was indeed delivered. If the recipient later charges that the operator failed to deliver the information, or conveyed a false impression, the operator can claim that the information was delivered with the care it deserved. Some operators actually transfer responsibility to the recipient by suggesting that the recipient learn about the Dunning-Kruger effect, to prevent future errors. Learn about the Dunning-Kruger effect. When you suspect this tactic, ask the operator directly, "What's your level of confidence in this information?" In asymmetric warfare, improvised explosive devices (IEDs) are usually buried under roadways or hidden in street litter. Similarly, in politics, assets intended to harm targets must sometimes be concealed to be effective. For instance, the operator might conceal knowledge that a critical component supplier is about to enter bankruptcy. Or the operator might display or profess indifference toward a prize to convince the target that the prize is unimportant, and to conceal the operator's own plans to seize the prize. With IEDs, the goal is to induce targets to drop their guard, to give the operator a free hand for a time. When you notice that someone known for ruthlessness displays a puzzling indifference to an asset, search for IEDs. search for IEDswhen we have so many items to track that their sheer number reduces our ability to address them. Operators intent on demonstrating their target's incompetence can exploit the Zebra Effect by first deluging the target with irrelevant, distracting demands, and finally assigning something really important with a tight deadline. The target, overwhelmed, might not notice the important task, but even if that task is noticed, the target's attention is already saturated. The substandard performance that follows is a result of the operator's actions, rather than the target's, but the operator can usually contend that the target is incompetent. When you receive assignments, the first step is determining their priority. If you have any doubt about priority, ask the operator directly for guidance. For more devious political tactics search for devious political tactics. Read Kruger and Dunning's original paper, courtesy the American Psychological Association. For more about the Dunning-Kruger Effect, see "The Paradox of Confidence," Point Lookout for January 7, 2009; "How to Reject Expert Opinion: II," Point Lookout for January 4, 2012; "Overconfidence at Work," Point Lookout for April 15, 2015; "Wishful Thinking and Perception: II," Point Lookout for November 4, 2015; "Wishful Significance: II," Point Lookout for December 23, 2015; "Cognitive Biases and Influence: I," Point Lookout for July 6, 2016; and "The Paradox of Carefully Chosen Words," Point Lookout for November 16, 2016. Would you like to see your comments posted here? rbrenqyZLjocZKvCOLKPQner@ChacMbfNNQIXwYYpVxTWoCanyon.comSend me your comments by email, or by Web form. See also Workplace Politics, Conflict Management and Devious Political Tactics for more related articles. I offer email and telephone coaching at both corporate and individual rates. Contact Rick for details at rbrenXsiFKHXmdbXTCnakner@ChacsWXOzPvpmPnCeAVvoCanyon.com or (650) 787-6475, or toll-free in the continental US at (866) 378-5470.